Whenever I think of the State of Montana, I think of Montanans I know. An aunt and uncle live near the small town of Victor. One of my childhood friends lives in Missoula. During visits, I’ve always enjoyed the wild, almost primitive landscapes. Like many Western States in the U.S., Montana’s “feel” has changed little from its Territorial days. Aside from modern technological features and architecture, the main difference is peacefulness. The fourth largest State by land mass and 44th population rank contribute to that frontier-like appearance. While Montana Admission Day won’t be until November, the date of the creation of Montana Territory appears as an important day on my events calendar, today. The fluid nature of nineteenth century U.S. territorial boundaries began to solidify around the time of the creation of this Territory, too. Early on, what is now modern-day Montana was part of Louisiana Territory, then Nebraska Territory. Later, the western portion was Oregon Country, then under dispute between Britain and the United States. The mid-1800s saw the Western area split into Oregon Territory and Washington Territory. The East became Dakota Territory and Idaho Territory. Montana Territorial history began its dawn during the times of Idaho Territory. Idaho Territory was an unwieldy, difficult to administer land mass. It was comprised of all of modern day Idaho State, nearly all of modern day Wyoming, and all of modern day Montana. Idaho Territory had been created because western Washington politicians wanted to discard the vast eastern parts of the territory in order to assure continued political power and to ensure that Olympia could cement its place as Territorial capital of Washington. 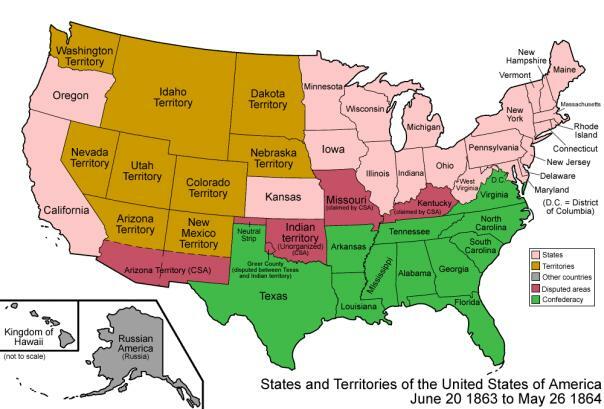 It was during the 1860s and the American Civil War that more consolidation and organization took place in the West. President Lincoln not only had to deal with a crushing domestic rebellion, but had to administer the advancing forces of “manifest destiny”. Former Ohio Congressman Sidney Edgarton was serving as Chief Justice of Idaho Territory. In 1864, he was selected by Idaho residents to travel to Washington D.C. to lobby President Lincoln and members of Congress to have Idaho Territory split into three portions. They hoped for the creation of new boundaries for Dakota Territory, Idaho Territory, and Montana Territory. While Edgarton was visiting with the President, he asked to be named Territorial Governor of Montana. While Edgarton was on the way home from the nation’s capital, The new Montana Territory was organized by an Act of Congress that was signed into law by President Lincoln on May 26, 1864. In December, members of the territorial legisleture were selected and then convened at Bannack, Montana Territory. The town became the first territorial capital. protect commerce and settlers. Federal control and defense escalated during the gold rushes that came about after the end of the Civil War. Major battles took place during the last part of the Indian War era. The most noteworthy Montana Territory conflicts included, Red Cloud’s War, The Great Sioux War of 1876, The Nez Perce War. 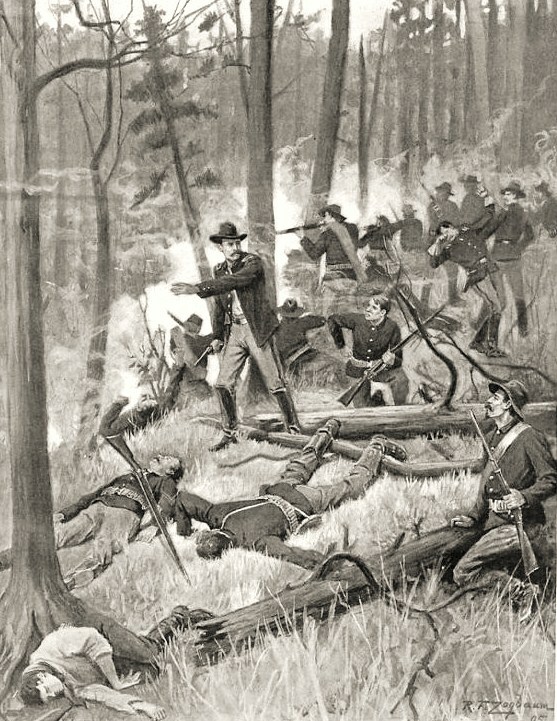 Important and infamous battles included the Marias Massacre, Custer’s Last Stand at the Little Bighorn, the Battle of The Big Hole, and the Battle of Bear Paw. The final armed conflict between the U.S. Army and Native Americans, in the Montana Territory, was the Battle of Crow Agency. The first efforts at Montana statehood sprouted in 1866 with a constitutional convention but that quickly failed. 18-years later, another constitutional convention took place in Helena in 1884. The meeting yielded a document that was eventually ratified by three quarters of the citizens. However, Federal approval was delayed because of Washington infighting. Finally Congress passed legislation, in February of 1889, to allow statehood for Montana Territory. President Grover Cleveland signed the omnibus bill to grant statehood to four States. Washington, North Dakota, South Dakota, and Montana. A third constitutional convention was convened. Another document was crafted that conformed to the needs of Montanans and the Federal government. 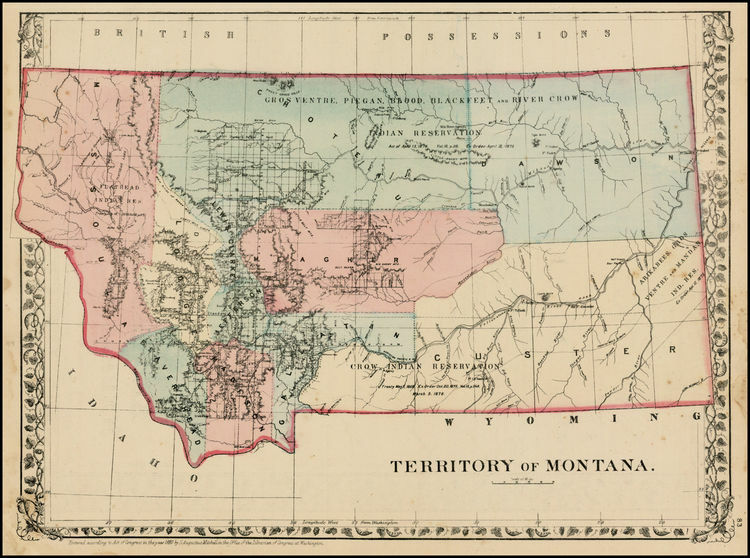 President Benjamin Harrison affirmed that Montana was the 41st State in the Union on November 8, 1889. This entry was posted in Controversy, History, Politics and tagged Abraham Lincoln, Benjamin Harrison, Civil War Era, Dakota Territory, Grover Cleveland, Idaho Territory, Montana, Montana Territory, Nebraska Territory, Oregon Territory, Washington Territory. Bookmark the permalink.